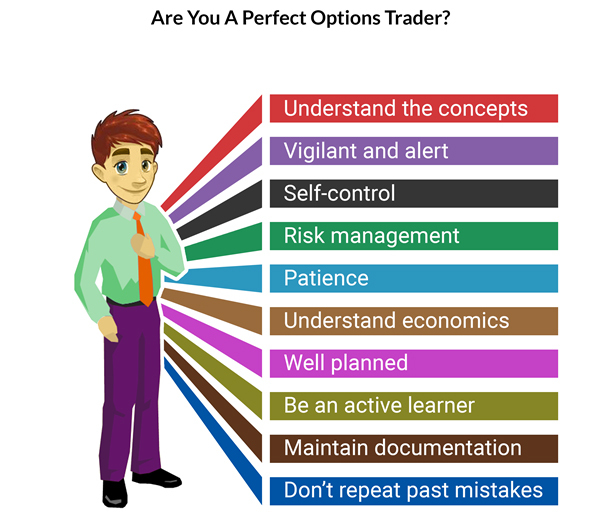 Are you a perfect Options Trader? Options trading is mind-wrecking business. There are numerous options trading strategies, each with its own logic and purpose. Options trading is mind-wrecking business. There are numerous options trading strategies, each with its own logic and purpose. While trading in the futures and options segment, one needs have all the strategies on the tip of his tongue to be able to devise ways to earn profits. The futures and options market is fickle, and you must be ever vigilant to sniff out possibilities of arbitrage. You must be alert and have a constant watch over the F&O margin requirements to not be caught off guard when an opportunity presents itself. As an option writer, you have no right, but only an obligation to buy from or sell to the option holder. Your risk can be theoretically limitless. Hence while writing the option, you must keep realistic assumptions, make cogent predictions and exercise self-control. Being greedy can be fatal. People have different personalities and traits. We all do not think alike. In fact, the F&O market is a zero-sum game which means people with opposite views come and predict the price of the asset in the future. In such a scenario, every options trader must adopt trading strategies to suit his personality, risk-appetite and thought process. You should not just imitate the market sentiments. You must know how to handle yourself more than anything else. Even tiny news may drastically change the market, but having control over yourself shall help you achieve success. Tiny losses cannot be given too much attention. Only a trader who can keep calm can play bigger games and earn significant profits. Innumerable factors affect the market from across the globe. A good options trader must understand micro and macroeconomics to be able to predict the effect that an event will have on the price of his asset. After all, trading is not just about earning, but also not losing money. Planning is an essential pre-requisite in options trading. Whether it is the objective of investment, target returns or strategies involved in the process; you must deduce all your trades so that funds are not unnecessarily blocked thus losing an opportunity for arbitrage. Every successful player in the market has one thing in common: he learns from his mistakes and never repeats them. Reading and learning new things will make you what others are today. Reading books, research papers, watching videos and interacting with other people help you in learning valuable lessons. Lastly and most importantly, there is a lot you do along with trading. You can only manage everything correctly if you have a habit of taking a risk and following a correct procedure. A perfect options trader has a right routine to follow every day. Having read this, visit www.indiainfoline.com and open an account to start options trading!